Madrid, J., Robbins, A., Scarince, C., Godwin, H. J., & Hout, M. C. (2016). Visual spatial attention: What it is, how it works, and what it does for us. To appear in Spatial Attention: Function, Influences and Performance by Nova Science Publications, Hauppauge, NY. Overview and recent considerations. Advances in Psychology Research, Volume 112, Nova Science Publications, Hauppauge, NY. Scarince, C. (2016) Coping with a MAD World: Visual Search Strategies in Dynamic Environments. The 2016 Rocky Mountain Psychological Association Convention. Denver, CO (April, 2016). Scarince, C. (2015) Cutting through the MADness of dynamic search. Graduate Research and Arts Symposium 2015: New Mexico State University (March, 2015). Scarince, C. (2014) Further investigation into recall wins over losses in a gambling scenario. Graduate Research and Arts Symposium 2014: New Mexico State University (March, 2014). Scarince, C., & Hout, M. C. (2016). Finding the green ketchup bottle: Investigating how non-essential features sometimes aid in search. The 24th Annual Object Perception, Attention and Memory conference: Boston, Ma (November, 2016). Scarince, C., & Hout, M. C. (2016). I beat the odds, right? The effects of expectancy on gambling memory. ARMADILLO, the 2016 Southwest Cognition Conference: El Paso, Tx (September, 2016). Scarince, C., & Hout, M. C. (2016). Investigating dynamic feature prevalence and quitting thresholds in Multi-element Asynchronous Dynamic (MAD) search. The Vision Sciences Society 2016 Meeting: St. Petersburg, Fl (May, 2016). Sabik, M., Scarince, C., Papesh, M. H., Godwin, H. J., Goldinger, S. D., & Hout, M. C. (2016). Rare targets induce less “perceptual readiness:” Evidence from pupillometry. The Vision Sciences Society 2016 Meeting: St. Petersburg, Fl (May, 2016). Scarince, C., & Hout, M. C. (2015). Cutting through the MADness: Investigating visual search efficiency in dynamic displays. The 23rd Annual Object Perception, Attention and Memory conference: Chicago, Il (November, 2015). Scarince, C., & Hout, M. C. (2015). I Won (As Far As I Can Remember)! Broad Implications of the Incongruity Effect. Sixteenth annual meeting of the Society of Personality and Social Psychology: Long Beach, CA (February, 2015). Scarince, C., & Hout, M. C. (2014). Investigating the effects of depth perception on the evaluative conditioning of abstract objects. The 22nd annual Object Perception, Attention and Memory conference: Long Beach, CA (November, 2014). Scarince, C. (2015) Finding Waldo: The Basics of Visual Search. Invited talk given at Illinois Wesleyan University (November, 2015). Scarince, C. (2015). Cutting through the MADness: Understanding Operator Performance on Complex and Dynamic Search. Talk was given at the Departmental Meeting, Psychology, NMSU (February, 2015). Scarince, C. (2014). Conditioning of non-evaluative traits. 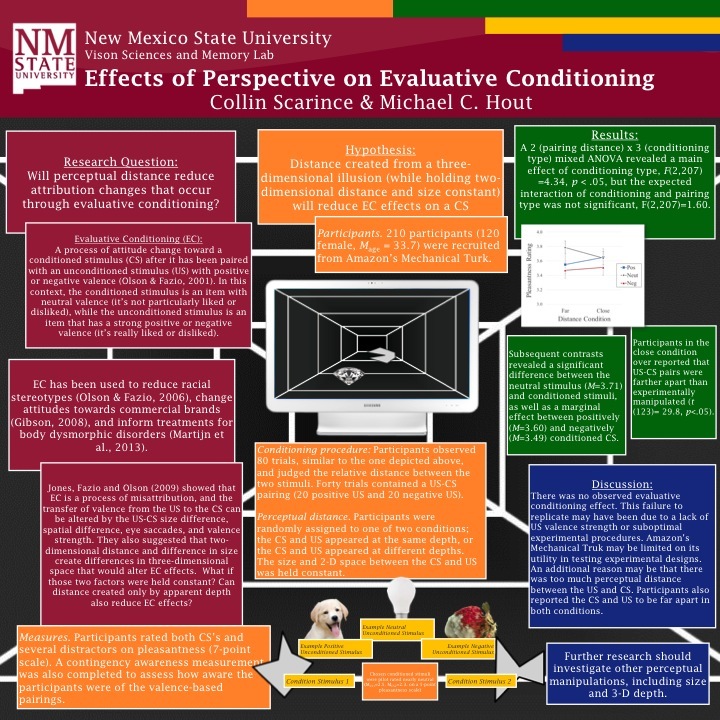 Talk was given at the Departmental Meeting, Psychology, NMSU (April, 2014). Raut, Y., Ruckle, L., Scarince, C. (2014). Are you man enough? Social validation and self-affirmation after masculinity threat. Talk was given at the Departmental Meeting, Psychology, NMSU (February, 2014). Vision Sciences and Memory Lab, Department of Psychology, NMSU. Disruptive Behaviors Lab, Department of Psychology, UW. Trauma and Bereavement Lab, Department of Psychology, UW. Camp Councilor, Computer Science Adventures Camp/Young Women in Computing Camp, New Mexico State University.